Bring your property’s beauty back to life. Before any of our painting or restoration services can take place, a proper cleaning of the work area is a must. Nothing gets a space cleaner than power washing. Whether in a residential or commercial setting, power washing’s ability to deeply clean a space can help bring any piece of property back to life before undergoing a beautiful new transformation. 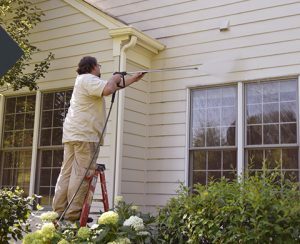 Our experts know that while power washing may look easy on the surface, it’s actually a highly skilled and potentially dangerous process that can yield amazing results in the right hands. That’s why, instead of attempting to rent a machine and do it yourself, employing an experienced power washer from Color Concepts is the best way to ensure your space comes out perfect and clean―just the way you want it. If you’re interested in exploring the benefits power washing can bring to your property, call us today. What are the benefits of Power Washing? Removes damaging substances like mold and mildew. Increases the value and safety of property. Makes your outdoor spaces more appealing. Provides a surface adequately prepared for finish work.